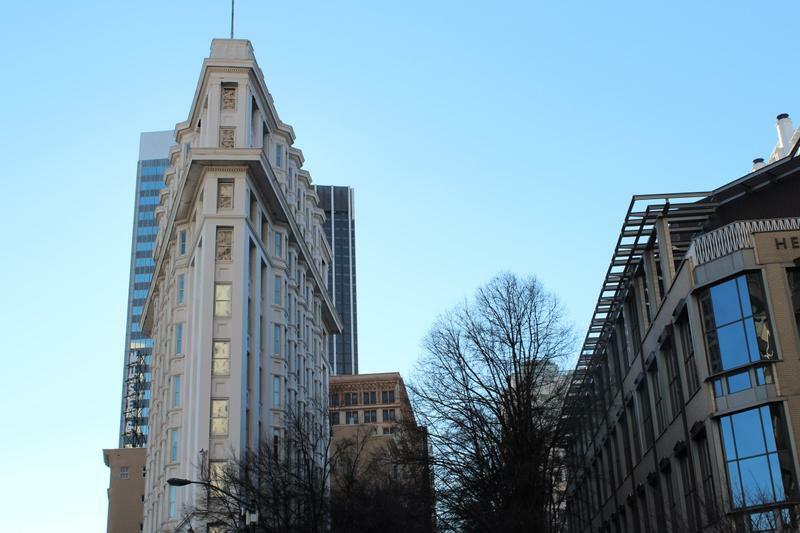 The Atlanta Tech Village in Buckhead includes hot desks and flexible lease options for technology startups. The Atlanta Tech Village in Buckhead features an independent coffee shop, free beer on tap, video game consoles, nap rooms and some desks. Office spaces like this go by many names: tech incubator, maker space, startup accelerator, hub, innovation center. Technology companies have been eager to put entrepreneurs, ping pong tables and tech support all in one building — especially within the last five years. According to Tino Mantella, president of the Technology Association of Georgia, there are more than 80 of these incubators and innovation centers in Georgia and most of them are in the Atlanta area. “These are spaces where young companies can go to collaborate with other companies to be trained and to really create an atmosphere where they have a better chance of success,” Mantella said. 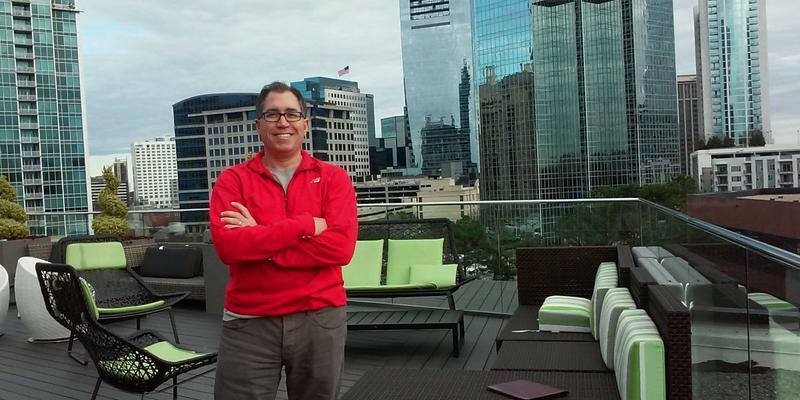 Pete Davis, CEO of GreenPrint, says he enjoys working from the roof of the Atlanta Tech Village. Pete Davis is one entrepreneur who has taken this route. He is CEO of GreenPrint, a company that launched in July 2014. It takes money spent on fuel from large trucking fleets and gas stations and redistributes it to renewable energy projects and nonprofit groups like Trees Atlanta. Davis and his co-founder worked out of their homes until he found out about the Atlanta Tech Village. The Atlanta Tech Village in Buckhead is one of more than 80 incubators and innovation centers in the state of Georgia. Most are in the Atlanta area. Davis said he loves the flexibility. He pays about $1,500 a month for the glass office space he’s renting and since it’s a month-to-month lease, startups can move out when they need to. 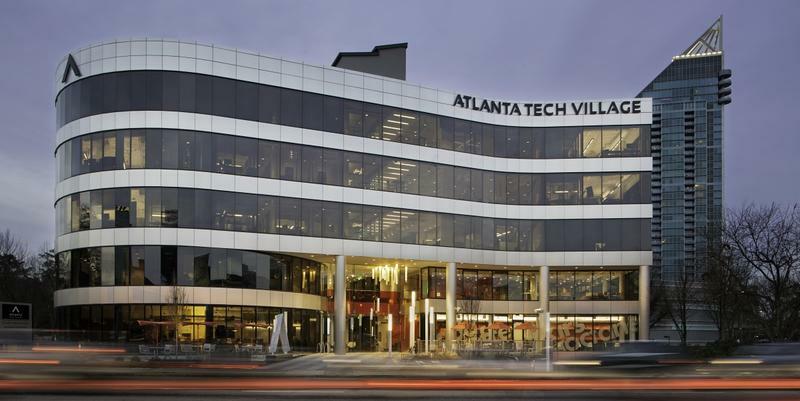 The Atlanta Tech Village was founded by entrepreneur David Cummings in 2013 and has grown fast. It now hosts many seminars. Sometimes, Davis said, it is too much. According to Davis, one valuable aspect of working in a startup incubator is collaboration with other startups. He runs into Mikhail Avady from SmartUp Legal on his hoverboard and in the elevator quite often. Avady’s company, SmartUp Legal, uses technology to make legal services like filing a patent cheaper. The second Microsoft Innovation Center opened in downtown Atlanta in December 2015. Kipp Ramsey works for a startup called Terminus at the Atlanta Tech Village. He said tech startups thrive off of each other. This kind of office space is now becoming even more popular. Microsoft’s Business Evangelist Bradley Jensen hopes to bring something similar to the Flatiron building in downtown Atlanta, which now houses the country’s second Microsoft Innovation Center. The Flatiron Building has been renovated to create space for software startups, student entrepreneurs and job seekers. Jensen helped launch the first U.S.-based “innovation center” in Miami in 2014. Microsoft is planning two more in New York and Philadelphia this year. The Flatiron Building was renovated to create space for software startups, student entrepreneurs and job seekers. The building is also home to the city-sponsored Women’s Entrepreneurship Initiative and a separate Georgia Tech innovation center. Tech incubator office spaces were popularized in Silicon Valley, the start-up capital of the world. But at the grand opening of the Microsoft Innovation Center last month, Mayor Kasim Reed said Atlanta is not trying to be like the Valley. Microsoft says its innovation center is what the city of Atlanta has been missing: another office space to connect tech groups and businesses in a central location.